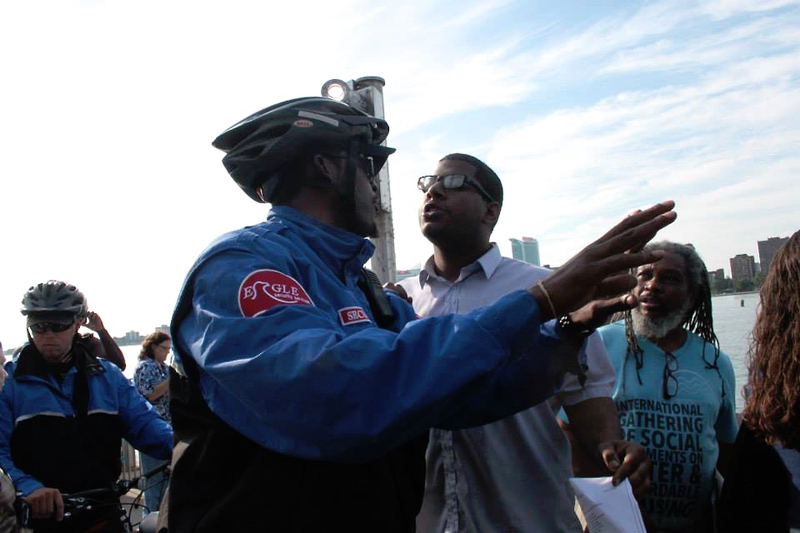 Private security guards attempting to remove demonstrators for water rights from the Detroit RiverWalk, a public space managed by Detroit RiverFront Conservancy. An op-ed by Detroit Resists published in The Architect’s Newspaper on 1 September 2016. In their response to William Menking’s review of The Architectural Imagination, the curators of the exhibition, Cynthia Davidson and Mónica Ponce de León, call out Menking for “his egregious word substitution in one phrase.” Menking wrote that “[the curators] assert that the projects are entirely speculative and ‘offer no serious solutions for a city beset by real problems’.” The curators point out that they used the word “concrete” instead of “serious” in their original statement; while the projects in The Architectural Imagination were not “concrete solutions,” the curators argue, these projects were nonetheless “serious.” Regardless of how one parses the meaning of “serious” in relation to The Architectural Imagination, the curators invite us to read their “Response” as closely as they attempt to read Menking’s review. When we engaged in that reading of the curators’ “Response,” we also find some wordplay worthy of note. What prompted an advisory board with a decided leaning towards market-oriented neoliberal urbanism to be recast as “an advisory board of community activists” is a not uninteresting question, but we—just like the curators in their “Response”—are more interested in the effects of this rhetoric than the reasons for engaging in it. In reframing the members of their advisory board as “community activists,” the curators rhetorically annihilate authentic community activism in Detroit—activism that has been resisting emergency management, austerity politics, disenfranchisement, and ethnic cleansing well before and all during the course of their project—and they delete this activism from the architectural imagination that they so seriously want to advance. This annihilation allows the curators to co-opt the term “community activism” to describe philanthrocapitalism, public-private partnerships, corporate nonprofits, and the culture industry. In so doing, the curators invite us to occupy a world in which “community activism” is an appropriate name for the activities of the state, foundations, real estate development enterprises, and, presumably, the architects who serve them. Through nothing else than the magic of word substitution, we see meetings with philanthrocapitalist development groups becoming “community meetings” and “community meetings” offering revelations of “neighborhood aspirations.” Once again, the curators perform an annihilation by co-option: otherwise unrepresented “neighborhood aspirations” are here conjured up through some of the very entities that these neighborhoods are currently opposing. By putting architectural ideas and forms on the table for Detroit, The Architectural Imagination gives the city’s residents access to a high level of architectural design and language. This access empowers citizens to engage in discussions about the city’s future direction before that direction is decided by existing power structures. In staging an exhibition of speculative architectural projects as a gift of “a high level of architectural design and language” to Detroit’s residents, we hear the echo of civilizing missions whose colonial authority is cast as educative and morally uplifting; in the claim that the exhibition of these projects “empowers citizens,” we see the imagination of an abject citizenry with no capacity to empower themselves; in the notion that “the city’s future direction” has not yet been decided by “existing power structures,” we see a disengagement from a city whose ongoing reality is, to a great degree, the attempted imposition of precisely that direction by precisely those structures; and in the claim that the speculative architectural projects in The Architectural Imagination “address inequality, sustainability, insecurity, segregation, and much, much more,” we hear an attempt to co-opt the work of organizations that are actually working with and for the communities dealing with those issues. In a final exercise of word substitution, let us substitute the imaginary “community activists” invoked by the curators of The Architectural Imagination with actual community activists currently resisting mass water shutoffs, mass foreclosures, mass evictions, racial injustice, police violence, food insecurity, education privatization, and other threats facing Detroit’s residents: We the People of Detroit, Detroit’s People Platform, Detroiters Resisting Emergency Management, Black Lives Matter Detroit,Detroit Eviction Defense, Michigan Welfare Rights Organization, Detroit Black Community Food Security Network, People’s Water Board, and many other groups—none of which the curators of The Architectural Imagination apparently saw fit to engage. When seen in the context of the work of these groups, we cannot understand the engagements with “inequality, sustainability, insecurity, segregation,” and the other issues the curators claim for The Architectural Imagination as at all serious. Moreover, we also believe that “architecture”—whatever that contested word is taken to mean—can find much more inspiration, agency, and relevance by learning from and working with communities and activists engaged in issues around inequality, sustainability, insecurity, and segregation than by claiming those engagements by little else than fiat. In the introduction to The Architectural Imagination published in the project’s catalogue, Cynthia Davidson approvingly quotes the following words of the anthropologist Arjun Appadurai: “The imagination today is a staging ground for action, and not only for escape.” If Davidson had turned the page in the book in which Appadurai wrote these words, she would have read Appadurai’s subsequent qualification of his claim: “It is important to stress here that I am speaking of the imagination now as a property of collectives, and not merely as a faculty of the gifted individual (its tacit sense since the flowering of European Romanticism).” With its celebration of the work of “visionary American architectural practices” and its tacit disregard for actually-existing communities, The Architectural Imagination advances just the model of imagination that Appadurai is writing against. We think, then, thatThe Architectural Imagination fails to meet its own standard for imagination. Seriously.